While Sony fanboys will say that Microsoft doesn't have any good Xbox One game exclusives, they're dead wrong - ask anyone with an Xbox, and they'll be rattle off half a dozen games well worth your time. But to further dispel the myth that there's nothing to play on the Xbox One, Xbox One S and Xbox One X, we've put together a guide to the best games on the platform. 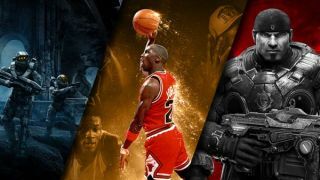 From solid third-person shooters like Gears 4, to radical racing games like Forza Horizon 3 and Forza Horizon 4, the system is jam-packed with both first-party and third-party games that you need to check out. Read on to see which games make the Xbox One shine, and keep checking back periodically: we update this list with new titles we feel have become part of the exclusive club of the best Xbox One games. Want to know what Microsoft have on the horizon? Then check out everything we know about the next Xbox. What is the best game on Xbox One? Well, it depends what types of games you're into. We've tried to put together a collection that covers a variety of genres, so there should definitely be at least one that suits your taste. What is the most played Xbox One game? The most played Xbox One game is constantly changing but currently battle royale Apex Legends is extremely popular, as is open world adventure Red Dead Redemption 2 and sandbox Minecraft. Which Xbox is best? The next-generation of Xbox is right around the corner, but if you don't mind sticking with the current generation then your main options are the Xbox One S and the Xbox One X. We've put together a handy Xbox One X vs Xbox One S guide to help you decide which is best for you. Is Xbox better than PlayStation? Good question. And it depends what your habits are and what you're looking for from a console. We've put the two consoles head-to-head in our PS4 vs Xbox One: which console is best comparison, where we cover everything you'd need to know about each console – though you can also see if our round-up of best PS4 games tempt you over the Xbox One titles below. Odyssey is a graphically stunning Xbox One game which will take you to the heart of Ancient Greece – easily securing it a place in our collection of the best Xbox One games. Just make sure you have the time to play it because there's over 100 hours of content to enjoy here. In Battlefield 1 for the Xbox One, DICE takes players back in time to World War One and by doing so completely rejuvenates the once stagnating franchise. Check out our Battlefield 1 review for more information. After a long development and lots of anticipation, Xbox indie exclusive Cuphead finally released in 2017. Was it worth the wait? It certainly was. Cuphead is a run-and-gun platformer with stationary boss fight levels thrown in, and it's certainly one of the best Xbox One games of the moment. With visuals and a soundtrack inspired by 1930s animation, but gameplay inspired by the platformers of the 80s, this game has had us torn since we first tried it. It's lovely to look at but its gameplay is challenging and you're going to find yourself frustrated... and dying a lot. Check out how Spelunky, Dark Souls and Isaac made death matter again. You can read our Dishonored 2 review right here. We are also very excited to see what id Software have in store for us with sequel Doom Eternal. The choice of Unreal Engine makes for vast open environments and sexily SFX-laden combat – fortunately, you can pause the latter to issue orders if the onslaught becomes overwhelming. It's a genre giant and easily one of the best Xbox One games. We can't wait to see what BioWare has up its sleeve for Dragon Age 4. All things considered, Fallout 4 is one of the best games Bethesda has ever made, and definitely one of the best games currently available on the Xbox One consoles. FIFA is, for many console owners, a highly anticipated annual event. The latest and arguably greatest instalment in the football sim series has arrived in the form of FIFA 19, and it's straight into our list of the best Xbox One games. Fortnite Battle Royale has had a meteoric rise since its release in 2017, and it's not hard to see why. The free-to-play battle royale Xbox One game offers players an energetic and enjoyable online multiplayer experience , with a concept that pretty simple to get to grips with: just be the last person standing. Constant content updates keep Fortnite feeling fresh over a year since its launch so it easily gets a place on the best Xbox One games list. You can check out our definitive Fortnite Battle Royale review here. It's really good fun, and well-worth buying. Don't miss our full Forza Horizon 4 review. Instead, the Xbox One consoles get the Gears of War template we all know and love with a few extra features gently stirred into the pot. For a start, the jump to current-gen tech made all the difference to The Coalition's first full-fat Gears title. Spend a little time in the previously remastered Gears of War: Ultimate Edition and you'll see how small and confined those original level designs were, even with a graphical upgrade to make it feel relevant again. We can't help but wonder if The Coalition will be able to top this with Gears 5. Not only is it one of the best sandbox games on the Xbox One platform, GTA V is also the best golf game, the best tennis sim, the undisputed virtual yoga champ, one of the best racers... it's even a pretty serviceable MMO. However you play GTA V – a multiplayer muckabout, a story-driven third-person actioner, a flight sim – it reveals itself to be the best game on both this generation and the last. One of the very best Xbox One games. Disturbing, insightful and extremely enjoyable to play, this is a game worth taking a look at if you're interested in the best Xbox One games. A stunning Xbox One game for those who appreciate an engaging story. The prequel, Life is Strange: Before the Storm, is equally mesmerizing. Okay, so Hideo Kojima's last game for Konami – and his last ever Metal Gear game – might be a little tough for the MGS n00b to get to grips with, but it's still one of the best stealth-action games ever crafted. It's undoubtedly worth a spot on our list of the best Xbox One games. Minecraft released ten years ago, but it's still as popular as ever with adults and kids alike. The sandbox survival game allows players to build with blocks in a 3D-generated world, providing a perfect creative outlet for those artistically inclined. Monster Hunter is a classic franchise that's been going for a long time, but with its return to console it's been given a new lease of life and was dragged kicking and screaming into 2018. Not had enough Ori in your life? The game will be getting a sequel in 2019 called Ori and the Will of the Wisps. It will pick up where are story left off (no spoilers, please!) and will see Ori platforming his way through the eponymous forest for a second run. Your gaming collection isn't really complete if it doesn't have a quality horror title and if we had to suggest one for our best Xbox One games list it'd be the newest instalment in the Resident Evil franchise. Despite being the sequel to a prequel about the young life of the Lara Croft, this still feels like a Tomb Raider game that has grown up. The reboot which saw a brave new direction for the franchise seemed a lot of the time to be little more than a bit of light Uncharted cosplay, but Rise is a far more accomplished game - and we prefer it to the final instalment, Shadow of the Tomb Raider. Rise of the Tomb Raider has a genuine open world which feels like there is always something to do, and something more than just harvesting up collectibles in exchange for a light dusting of XP. The original Titanfall was a great game and its sequel, Titanfall 2, improves on it every conceivable way: the motion is more fluid, there are more distinct titans to choose from and, hold onto your hats here, there's actually a single-player campaign that might take the cake for the best first-person shooter story of the year. The skill with which Respawn has balanced this mix of styles in the sequel is remarkable – Titans have firepower in excess but they're easy to hit, and maps offer plenty of places for infantry to hide. Make sure to check out our Titanfall 2 review here. Geralt didn't have the smoothest of entries to console but after some heavy patching and a lot of angry words about visual downgrades, we're left with an RPG boasting tremendous scope and storytelling. Looking for an incredible single-player shooter for Xbox One? Look no further than the 2017 wonder that was Wolfenstein II. Picking up from where the original game left off, this game is a timely social commentary and a superbly silly adventure all rolled into one well-written package.